…we take a look at the shared DNA of three of Britain’s greatest grand tourers: The Aston Martin DB7, Jaguar XJS and Jaguar XK8. Legendary motoring writer Richard Bremner – who was there at the launch and production of all three - drives each car and tells us what they’re like to buy, own and maintain. Elsewhere, there’s a superb story of the restoration of an MG Maestro, we find out the pros and cons of buying Britain’s favourite classic, the Morris Minor, and buy three modern classics for £200 to prove just how much you really can get for your money nowadays. If you worked at Jaguar’s Browns Lane headquarters in 1980, it would have been hard to imagine that the company’s five-year old XJ-S coupe was going to live another year, never mind to 1996. Or that it would not only sire a successor, but provide the basis for a sports coupe that would save Aston Martin from oblivion. That saving came 25 years ago, the 1993 DB7 becoming the most successful Aston yet when it was replaced in 2004. Like the Aston, the 1996 Jaguar XK8 was heavily reliant on the XJ-S as a hardware source, if with extensive modifications, a new 4.0 litre V8 and a decidedly more modern look in which ghosts of the E-Type were easily seen. The father of these two, then, was the XJ-S… which you can read all about in the new issue of Practical Classics…. Seven decades after the Morris Minor made its debut it’s more popular than ever, and it’s not hard to see why. Was there ever a classic that blends practicality, affordability, ease of ownership and charm more successfully than the Minor? With excellent parts availability the Minor is easy to work on and simple to upgrade, plus it’s a classic with unsurpassed specialist and club support; the MMOC is hugely active and it even incorporates a section to encourage the next generation of enthusiasts. Is this the ultimate practical classic? Find out in our new issue, out now! With retirement approaching for Peter Cooper, his wife, Joan, had a suggestion to keep him occupied. ‘Why don’t you get yourself an old car and do it up?’ was her idea during spring 2014. ‘She was probably thinking it would take me 10, 15 or 20 years,’ laughs Peter. Instead, the restoration of this rare MG Maestro Turbo took around two and a half years. And that was quite a bit longer than intended, thanks to unexpected set-backs. Get the full story in the new issue of Practical Classics! Busy times at the Practical Classics workshop, with our two major projects being prepared for the Lancaster Insurance Classic Motor Show at the NEC this November. 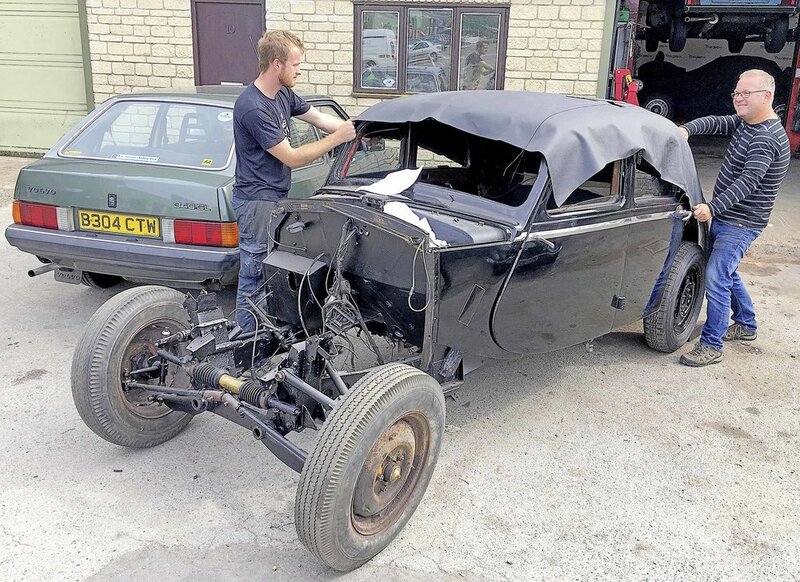 The Riley RMA will be rebuilt live on stage, whilst the TR6 will be on display, warts and all, for everyone to see – before it too gets a full restoration. BANGERNOMICS - THREE CARS WE BOUGHT FOR £200 EACH!